Add Collaborators to your WooCommerce.com account to allow someone else to help manage your store/site. This is a safe and secure alternative, allowing them access without providing a login and password. Note that Collaborator accounts cannot be used to activate licenses on your WooCommerce site. To activate licenses, connect your site using the account used to for the license purchase. Send your developer or consultant this article to explain how Collaborator accounts work. Log into your WooCommerce.com account. Go to the Collaborators tab in your My Account. Enter the WooCommerce.com email address of the developer/person you wish to add. If the collaborator does not have a WooCommerce.com email address you can create them for free in this walkthrough. Tick the checkbox(es) of items you wish to grant access to in Select Permission(s), and select Add Collaborator. Collaborators receive a notification email when added to your account. He/she will also then have an option on their WooCommerce.com account to switch to managing areas of your my-account to which you gave permission. A login and password to your account is unnecessary, keeping your account safe and secure and giving you full control. Change permission(s) of a collaborator by selecting the Edit link, then ticking or unticking the checkbox(es) of permissions you prefer. Save. 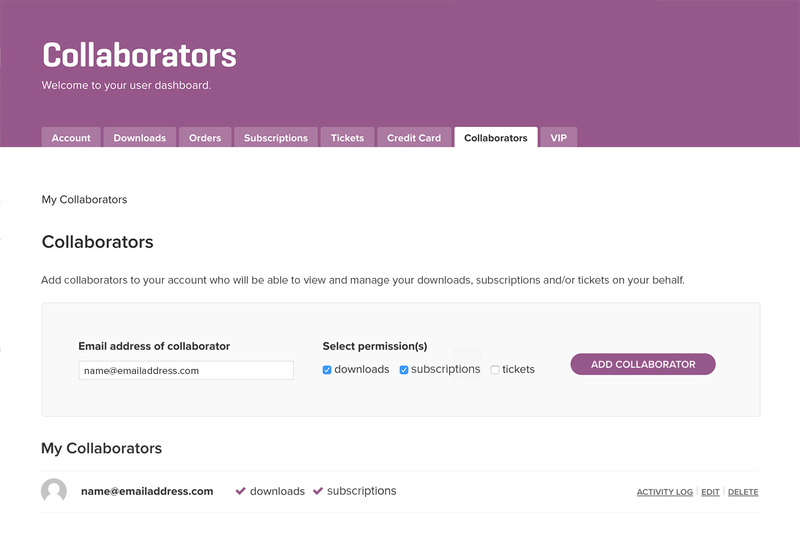 Collaborators (developers/consultants) can view and manage accounts they’ve been granted access to via their WooCommerce.com account. 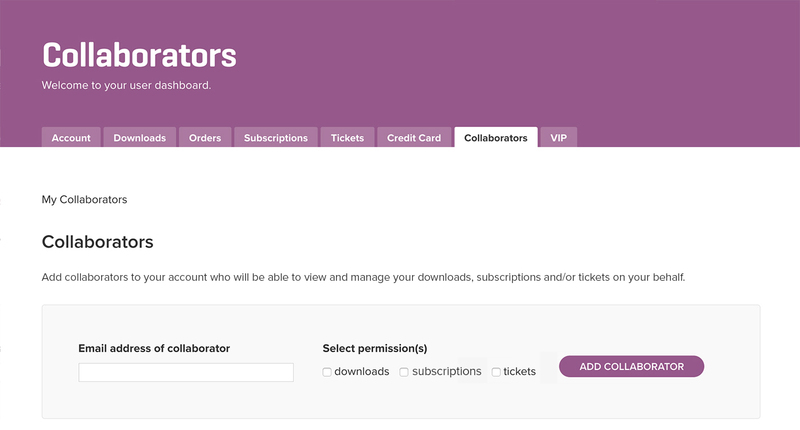 Go to the relevant Downloads, Subscriptions and/or Tickets tabs on your WooCommerce.com account. Select the client’s account/email address from the drop-down that appears, and the page refreshes with that content. A red notification bar appears at the top when managing items on behalf of a client to ensure you are aware of which account you are accessing.